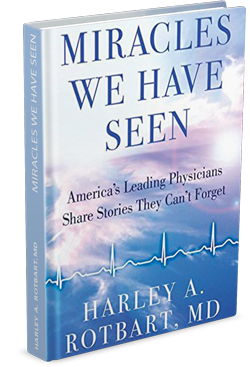 The stories in this book, written by leading physicians across the country, recount spectacular serendipities, impossible cures, breathtaking resuscitations, extraordinary awakenings, and recovery from unimaginable disasters. Still other essays tell of physicians’ experiences in which the miracle was more emotional than physical, yet also left a lasting imprint. Despite being at the forefront of medicine and science, what we don’t understand as physicians often exceeds what we do understand. And even when we think we understand, we are frequently proven wrong. This is a book about optimism and inspiration, and the realization that what we don’t know or don’t understand isn‘t necessarily cause for fear, and can even be reason for hope. 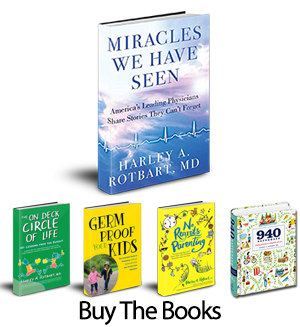 Rotbart, an author, speaker, and pediatric specialist, has assembled a collection of essays from top medical professionals in various disciplines that showcase patient outcomes that have defied all expectations and, in many cases, scientific explanations. The essays are written with a blend of technical detail, which fully explains the miraculous events, and a conversational appeal to the unknown, which will engage readers who feel there is more to life than the empirically verifiable. Rotbart’s compiled tales capture serendipitous timing, impossible cures, resuscitations, awakenings, moments when the spiritual and physical appear to touch, patients who have paid it forward, and many situations when good emerges from tragedy. Incredibly broad, both in the specialties represented and in the types of miraculous events described, this collection captures the hope that captivated those who experienced the events firsthand… the experiences and perspectives this book contains are sure to provide inspiration. The art of medicine involves empathy and communicating with families in a very personal way. The science of medicine requires understanding how evidence from well-designed research transforms patient care. The vignettes in this book are at the interface between the art and science. They touch our human spirit in such a profound and inspirational way. This remarkable book shows the humility with which medicine should be practiced and how fortunate physicians are to have such meaningful experiences. –Larry Kramer President, The William and Flora Hewlett Foundation, Former Dean, Stanford Law School. A remarkable volume of essays detailing prolonged effort and novel therapies leading to miraculous outcomes. Empathic care, co-produced by extraordinary teams of medical professionals, their patients and families. Every page speaks “gratitude.” These stories will contribute powerfully to cures, and equally to cures of burn-out and despair. The glory of medicine is the hope and inspiration that it provides to all, to save lives, to preserve spirits, to truly help humanity. This book captures the individual spirits of the families and the physicians. We devote ourselves to the families impacted by diseases and tragedy, and feel everlasting gratitude to the physicians providing care at the most difficult of times. This motivating book lifts all of our spirits. It gives examples of adversity, and then instills faith and a sense of triumph. The human spirit truly prevails. —Bernard Beitman, MD, author of Connecting with Coincidence; Visiting Professor, University of Virginia; former Chair, Department of Psychiatry, University of Missouri-Columbia. —Diane Debrovner, Deputy Editor, Parents Magazine. That may sound like a lot when there are adventures to plan and hours to fill. But as your child learns to walk, ride a bicycle, and drive, the years pass quickly. 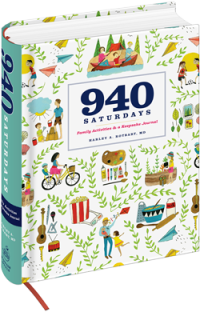 This beautiful package includes both a removable booklet with a thousand ideas for family activities that you and your child will love at every age, and a keepsake journal for preserving what you saw and did, thought and felt, so you can savor these memories in the years to come. No Regrets Parenting is time management magic for busy parents with kids from crib through college. But this is not like other “time management books.” Those are geared for efficiency with kids rather than for intimacy with them, for organizing rather than optimizing the time parents spend with their kids. How to get everything done is not the same as how to make the time spent with kids more meaningful and memorable. This is a book about capturing the precious moments of parenting that otherwise are lost in the name of efficiency. It will guide you in taking the mundane, exhausting routines of parenthood and turning them into special parenting events. It’s all about redefining “quality time.” No Regrets Parenting is written for parents before they set priorities that they’ll come to regret. 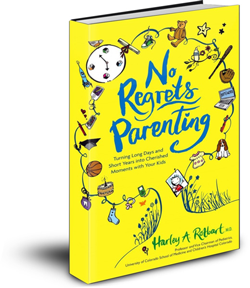 A book to be read when bedtime and bath time rituals are still observed, No Regrets Parentingis an easy to read guidebook that gives timeless advice to parents for whom time is in short supply. Jeffrey Zaslow, #1 New York Times bestselling coauthor of The Last Lecture; and Moving On columnist, The Wall Street Journal. Harvey Karp, MD, creator of the New York Times bestselling books and DVDs The Happiest Baby on the Block and The Happiest Toddler on the Block. The Complete Guide to Protecting (without Overprotecting) Your Kids from Infections (ASM Press, 2008). 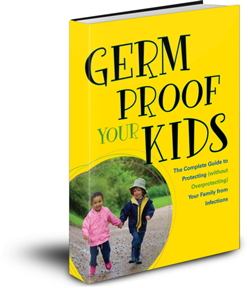 Germ Proof Your Kids is the one-stop shop for all of parents’ germ questions. The book is presented in 4 sections which address: the most common germs and the diseases they cause; children’s natural defenses and the prudent use of antibiotics and vaccines; the value of home remedies from grandmother and the health food store; and, how to understand and interpret the latest research news. The book brings everything parents need to know about kids’ infections together in one easy-to-read, concise book. The book has also become an important desk reference for doctors and nurses in clinics and schools across the country. By providing up-to-date, succinct information on all of the infections that kids bring to the clinic, this book helps health providers educate parents about germs and the best treatment options (including no treatment at all!). Marianne Neifert, M.D. (Dr. Mom®), pediatrician, bestselling author of Dr Mom: A Guide to Baby and Child Care and Dr. Mom’s Parenting Guide: Commonsense Guidance for the Life of Your Child; columnist for Parenting magazine, nationally renowned speaker, mother of five and grandmother of seven. A game plan for happiness and success in the major leagues of school, friendships, and family life. Everything a child needs to know about life can be learned from the dugout steps. Every pitch, hit, and play on the baseball field is its own life lesson. 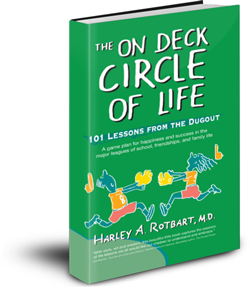 From taking charge under a pop fly, to taking risks on the base paths, to taking heart on the bench, THE ON DECK CIRCLE OF LIFE connects parents and their kids through the analogies, axioms, and allegories that baseball offers for life off the field. Written for kids of all ages to read, and for parents to read over their kids’ shoulders, this is a warm and wise playbook for the game of life. You and I share the belief that baseball is a great avenue to learning skills that can translate to all aspects of our life. I have shared your book with our foundation staff and encouraged them to incorporate the lessons into our character education program. Thank you for contributing to the development of healthy, happy children. © 2019 Harley Rotbart. All Rights Reserved.